ARISTOTLE AND DANTE DISCOVER THE SECRETS OF THE UNIVERSE BY BENJAMIN ALIRE SAENZ REVIEW! Summery : Aristotle is an angry teen with a brother in prison. Dante is a know-it-all who has an unusual way of looking at the world. When they meet at the swimming pool, they seem to have nothing in common. But as the two loners start spending time together, they discover that they share a special kind of friendship–the kind of friendship that changes lives and lasts a lifetime. And it is through their friendship that Ari and Dante will learn the most important truths about themselves–and about the kind of people they want to be. If I’ve ever judged a book too soon in to reading it was this one. I started reading Aristotle and Dante for BookTubeAThon 2015 and as I finished it I didn’t think much of the novel, leaving myself wondering why it got so many awards. But as more time passed and I got to thinking about what the story is actually about my mind changed completely. Aristotle is a teenager whos life is a little messy to say the least – that is until he meets Dante at the pool one day. Aristotle gains a friend; something he’s never had before and his life turns dramatically as he learns what growing up is actually about. His dysfunctional family play the constant worried parents as they watch him gain an independence trying to find out the secrets of the universe. As someone who loves a strong family element to a novel, this was perfect for me. There were no awkward love triangles, no cringey moments where you want to hide away just to spare the protagonists dignity. It was simply a wholesome story of two friends as they figured out how to make each other tick. When I went in to this novel I fully expected two lads on a road trip across America for some dramatic reason which definitely wouldn’t happen in real life. This meant that numerous times I would stop reading, flick through the book and think ‘is anything actually going to happen?’ The book itself is slow paced I’ll admit that, not much happens drama wise (so if you’re looking for something a little more action-y, stay well away.) But there are plenty of plot twists that keep you interested, some unexpected and others very much expected. The nature of the book is truly to dive deeper in to Ari’s personality. We are readers are learning about him as he learns about himself and it’s refreshing to be on that journey with the protagonist. I feel like Benjamin Alire Saenz got the progression of Ari and Dante’s relationship right. There’s no other word for it than ‘right.’ There wasn’t a part which left me wondering ‘would that really happen?’ I believed every part of it. Overall he created a novel of characters that were believable and real. The writing style is no different than what you come across with any teenage boy protagonist (think Perks of Being a Wallflower or Grow Up.) Aristotle is very much a lad, a little bit sarcastic and dry with his humour. It’s his personality which makes you absolutely adore him by the end of the book. The easy going way it was written made Ari’s heavy characteristics so much easier to read. The character development and depth of personality is some of the best I’ve ever read (well-done Benjamin) and I can see why this work got the Stonewall Book Award to name just one. My mistake when I read this was to read it slowly, 50 pages a day at most. Aristotle and Dante is a book that you’re best sitting down with a full day free and reading until you’ve finished. It’s no use flitting in and out of the characters’ lives, Aristotle needs your devotion for a few hours so you’re able to live in his mind as he does. I wouldn’t limit this novel to a Young Adult label, I think that people of any age can learn a lot about life from it. I cannot praise this book enough, I finally understand why so many people adore it. I could re-read it straight away to just try and find something new that I missed. 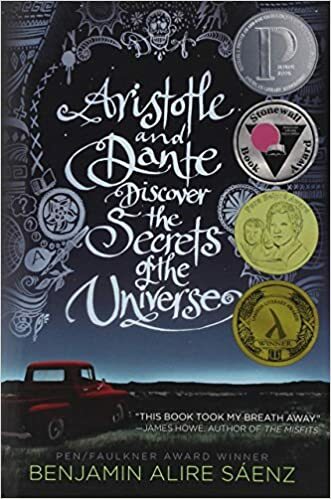 Aristotle and Dante Discover the Secrets of the Universe is one of the most beautiful coming of age stories I’ve ever had the pleasure of reading. I’ve seen this book all over instagram because its beautiful cover. Glad to see a review for it here. Great job! I’m definitely intrigued about this now. I’d definitely give it a go! It’s one of my favourite books of the year!